Panther geckos are rising in popularity as exotic pets, because of their beautiful coloring and because they're relatively easy to care for. Also known as Madagascar ground geckos, panther geckos are small, ground-dwelling lizards with big eyes and an appetite for crickets. These small geckos are known for not only their beautiful patterns but also for their interesting personalities. Juveniles can be very jumpy but tend to calm down and become quite docile as they get older. These animals hail from Madagascar, off the coast of Africa, hence their other name of Madagascar ground gecko. They're nocturnal, so won't be terribly active during the day. Although they're not ideal pets for homes with young children, who may want to pick up and touch the animal, panther geckos are suitable for first-time lizard owners, as long as they're prepared. These lizards don't respond well to stress; they don't like being handled and will bite as a warning if they feel threatened (it's usually not much more than a warning and won't do much damage). Panther geckos can lose their tails when they feel stressed; the tail will regenerate eventually but will look different. Panther geckos are like to hang out in fallen leaves and other hideouts on the ground but do have the ability to climb up an aquarium wall, so an enclosure with a secure lid is necessary when housing these small lizards. They're not the escape artists some other geckos are since they're not natural climbers, but if they get out of their enclosure, it could be dangerous for them. Typically a 10-gallon tank will suffice but if you plan on keeping more than one panther gecko in the same enclosure you should upgrade to a 20-gallon tank. Do not put males together; they're too aggressive and territorial to cohabitate. The substrate can be as natural as you want with bark chips and a dirt jungle mix that is available in pet shops. Indoor/outdoor carpeting cut to the size of your tank also works well and is easy to clean. Many panther gecko owners avoid putting climbing branches in their enclosures as these geckos can fall and hurt themselves. They should, however, have a humidity hide box to assist in shedding and to help maintain a 40 to 60 percent hygrometer reading in the tank. A small dish of water for drinking and several hide boxes also should be included in a panther gecko's enclosure. They tend to be shy, and so feel secure when they can retreat for a while. These small geckos don't require excessive warmth but they do need a basking area in the mid-80 degrees. This can be attained by using heat lights; ones that emit white light should during the day while heat lights that emit red or blue/purple light can be used at night. If your tank drops below 70 degrees at night because there are no heat lights on you should use the red or blue/purple lights or a ceramic heat emitter as to not disturb this nocturnal lizard. UVB lighting is not usually necessary since, in the wild, panther geckos do not get much sunlight. But if you are having issues with your gecko being lethargic and not eating well you can try adding UVB lighting for 10 to 12 hours during the day. Panther geckos are insectivores, meaning most of their diet consists of insects. They will eat whatever insect they can find in the wilds of Madagascar but in captivity, crickets are usually the food of choice.. Crickets are easy to find and can be gut loaded and dusted with calcium powder to provide all the essential nutrients a gecko needs. Other insects, such as silkworms, small beetles, mealworms, and super worms can also be fed as long as they are gut loaded, dusted with calcium powder, and of appropriate size: no bigger than the space between your gecko's eyes. Some panther gecko owners introduce leafy greens to their pets' diet, but this isn't necessary. You'll want to get your panther gecko from a reputable breeder who can provide detailed information about the animal's health and origins. 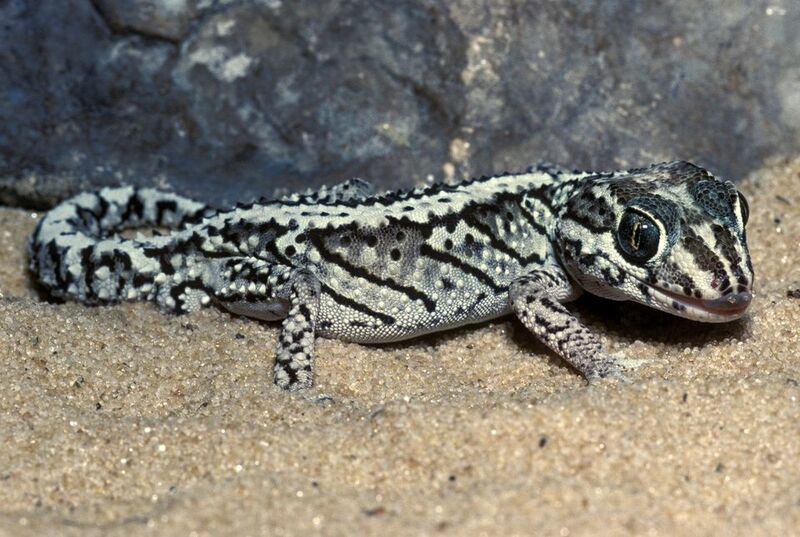 Captive-bred geckos are better options as pets than wild-caught ones. A gecko with dry spots on its skin may indicate a problem with shedding, often a sign of an underlying health condition such as a parasite or infection. Look for a panther gecko with clear eyes, a curious demeanor and a healthy appetite (ideally, you'll be able to watch it eat before bringing it home). Problems with shedding usually happen when a gecko is in unsanitary living conditions, or an enclosure that is not humid enough. Failure to shed also occurs when a gecko is overly stressed. It may not seem like a significant problem, but the extra skin can cause discomfort, affect its hearing and constrict its limbs. Metabolic bone disease is another ailment that can afflict geckos and other lizards. It's as ominous as it sounds; it occurs due to vitamin D and calcium deficiency and can lead to weakened bones, and if not treated, can be fatal. Like other gecko breeds, panther geckos are prone to parasitic infections. An examination by a veterinarian who specializes in lizards is sometimes the only way to detect parasites in a gecko. Don't try any home remedies to treat your gecko's health concerns unless you're being advised by a qualified veterinarian. You don't want to end up making what could be a treatable problem worse.